MOUNT PLEASANT, Pa., Oct. 3, 2018 /PRNewswire/ -- Peoples Gas ("Peoples"), in partnership with WATT Fuel Cell Corporation ("WATT" or the "Company"), installed the first Imperium™ Solid Oxide Fuel Cell (SOFC) system at a residence in Westmoreland County on Friday, September 28, 2018. This installation is part of the first field trial of a WATT fuel cell system by Peoples. Peoples has over 740,000 residential customers within their footprint, that spans Western Pennsylvania, West Virginia and Kentucky. With a commitment to bringing environmentally-friendly programs and technologies to their customers, Peoples entered into a Joint Development and Commercialization Agreement with WATT Fuel Cell earlier this year. The inaugural installation of WATT's fuel cell product in a residential home is one of the first steps toward reaching the ultimate goal of having a fuel cell installed in every residence within Peoples service territory. "With the first installations of the WATT fuel cells into homes becoming a reality, we can see the power of combining the best of our innovation and technology with the rich and plentiful natural resource that sits here in Western Pennsylvania. We are one step closer to having this clean, inexpensive and reliable source of energy available to every family here in the region in a way that will be incredibly responsible to our environment for generations to come," said Morgan O'Brien, President and CEO of Peoples. 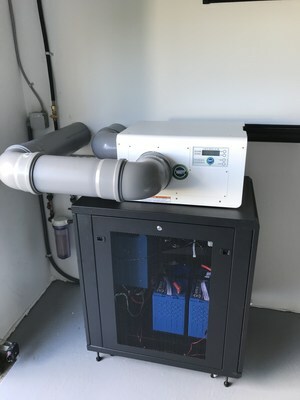 The system installed as part of the Peoples' field trial is a residential Imperium SOFC System that will convert natural gas through an electrochemical reaction to electricity, with little to zero emissions. It works in parallel with the electric grid, as well as other renewable resources such as solar, to generate power on-site at the time of need. Clean, compact and quiet, WATT's fuel cell system sits comfortably inside or outside the home, providing a power source that is Working All The Time®. "When we moved to Western Pennsylvania we didn't realize we were moving into the backyard of one of the country's more forward-thinking energy companies. Working with Peoples has allowed us to accelerate our entrance into the residential market. What better place to do that than right here in our own region with one of the region's leading energy companies," said Caine Finnerty, President and COO of WATT Fuel Cell. "And, with one of the world's largest natural gas shales right here, Pennsylvania couldn't be a more perfect place to launch our residential product." With over 60 million homes using natural gas in the United States, the success of the Peoples field trial is expected to advance WATT's commercialization activities nationally and afford WATT the ability to work with other distributed natural gas partners in the future, as well as help pave the way into key industrial markets. WATT Fuel Cell Corporation (www.wattfuelcell.com) is a manufacturer and developer of Solid Oxide Fuel Cell ("SOFC") stacks and systems that operate on common, readily available fuels such as propane and natural gas. WATT's proprietary, patented additive manufacturing process (AMP) has allowed them to produce commercially viable SOFC products for small scale and remote power applications. WATT's Hybrid Power Management system works in tandem with renewable power sources (Solar & Wind) and energy storage to provide quiet, efficient, affordable, and environmentally responsible energy solutions prioritizing a return on investment for customers across the globe. Peoples is an energy solutions provider serving approximately 740,000 homes and businesses in Western Pennsylvania, West Virginia and Kentucky. The company's mission is to improve the lives of its customers and to help build long-term economic growth for the regions it serves. For more information about Peoples, visit www.peoples-gas.com and follow Peoples on social media @peoplesnatgas.